It isn't clear how different the two payment approaches may be from one another. Samsung uses the Android operating system in most of its phones, but always tends to add its own custom features, apps and interfaces to its Galaxy S smartphones and Note devices. Samsung Pay, a replacement for Samsung Wallet, may be no different. Samsung is the world's largest seller of smartphones, which ought to make a difference in its ability to become a major player in mobile wallet services. Apple Pay, which launched last fall with the NFC-ready iPhone 6 and iPhone 6 Plus smartphones, gets much more attention, especially in the U.S., and is the clear frontrunner so far. Market research firm Gartner on Wednesday said Samsung had 24% of smartphone sales market share in the first quarter globally, ahead of Apple at nearly 18%. The next three positions all went to Android players, each with less than 6% market share: Lenovo, third; Huawei, fourth; and LG, fifth. At Mobile World Congress in March, both Google and Samsung discussed their upcoming mobile payment approaches. At the time, Sundar Pichai, senior vice president for Android, described Android Pay as an API (application programming interface) layer that developers could use for building a payments service. He said the service would rely on NFC (near field communications) and, eventually, biometric sensors like fingerprint scanners. The older Google Wallet service will continue, he added, but will rely on the new Android Pay framework. Samsung has had fingerprint sensors and NFC in its flagship Galaxy smartphones for three years. Apple Pay works with NFC and fingerprint readers in its latest smartphones as well. At MWC, Samsung said it would support both NFC and a secure magnetic technology from Samsung's acquisition of LoopPay, and both would be available in the new Galaxy S6 and Galaxy S6 Edge. The magnetic technology gives users the ability to make in-store payments at stores with conventional payment terminals that work with magnetic stripe cards. Banks and credit card companies have worked hard to get merchants in the U.S. to convert their older magnetic stripe payment terminals to support NFC payments from mobile phones or smart cards, but a complete transition will take many years, perhaps a decade, officials have said. Samsung recently sent emails to users of its older Samsung Wallet service that said the service will be discontinued June 30. A Samsung spokeswoman said the company will discontinue Samsung Wallet except in Korea on June 30 "as part of our long-term business strategy with Samsung Pay." She said Samsung Pay will be available in the U.S. and Korea this summer, but gave no other details. While mobile payment announcements from various smartphone makers are growing in frequency, there's lingering doubt that such services will drive much interest in buying the smartphones that support it. The biggest driver of hefty sales of the iPhone 6 and iPhone 6S in the fourth quarter of 2014 and the first quarter of 2015 was their larger display sizes and not their use of NFC capabilities with Apple Pay. 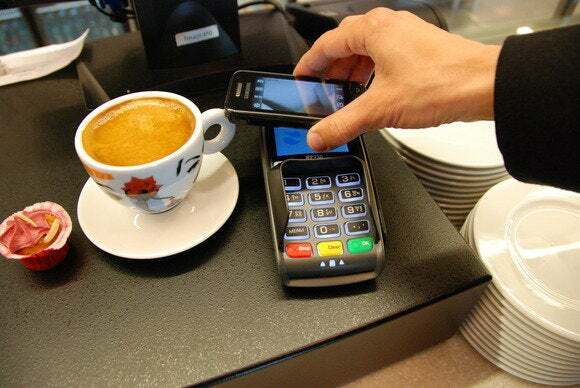 "I just don't think consumers see mobile payment as a need, since credit cards work just fine," said Carolina Milanesi, chief of research at Kantar WorldPanel. "Don't get me wrong, if they have Google Pay or Apple Pay or Samsung Pay, they might use it, but that's not an adoption driver for the hardware." Kantar's first-quarter smartphone market report showed Samsung in second place behind LG in the U.S., but that was before Samsung's new Galaxy phones were released in April. After Samsung faced a difficult year in 2014, Milanesi said Samsung didn't show much of a rebound in the first quarter. "I think the market is getting harder and harder for every phone maker," she said. Gartner noted that Samsung had a weak first quarter globally for smartphone sales, but they were still 11% above the fourth quarter of 2014. The new S6 smartphones and the Galaxy Alpha should push Samsung's fortunes higher, Gartner said. Gartner analyst Roberta Cozza noted that Samsung had been selling large-display smartphones (those with screens above 5 inches) for years before Apple did. As a result, she said Samsung probably won't need to worry about offering more models of different sizes to attract customers. "It has come the time more than ever when hardware and technology alone cannot make you win consumers at the high end, so Samsung will now have to add value on top of technology and hardware to compete more strongly and make users stick with its brand," she said. Milanesi suggested that Samsung and other phone makers should look beyond mobile payments as a differentiator and even find buyers in the mid- and low-tier price brackets who will pay for lower-priced devices. "The reality is that the opportunity in the high end is capped, and Samsung would be better off trying to figure out how to better drive margins in the mid and low tier," she said. Milanesi said there is demand for lower-cost phones in mature markets, even in the U.S, "where there are feature-phone users that need to be converted to smartphones and where competition from other Android players is weak." Twenty percent of U.S. phone sales in the first quarter were for feature phones, Milanesi said. With most average sales now under $199 (on contract) for new phones, "there's a big opportunity for any vendor if done right."